Following the Holy Spirit can be intimidating. 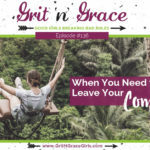 Questions arise like, “What if He asks me to give up control?” or “What if He takes me someplace I don’t want to go?” Cheri and Amy have grappled with the same questions. They’re learning to surrender to the Holy Spirit, though, because they’re starting the see the unexpected joy of seeing Him as a present from God. 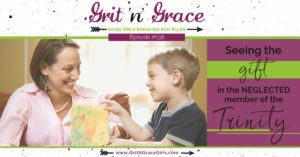 This episode is filled with their real-life stories of learning to receive, unwrap and enjoy the Holy Spirit as a gift! 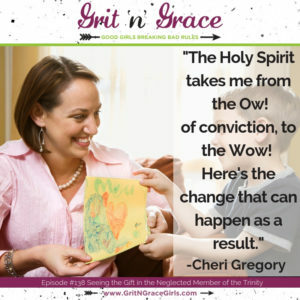 When has the Holy Spirit lead you from “ow” to “wow”? What would it take to convince you to give up control to the Holy Spirit? How have you experienced the work of the Holy Spirit? Amy: Okay, Susie described an early encounter with the holy spirit and said, “The helper had arrived.” I just love that. So, Cheri, how have you experienced the Holy Sprit as your helper? Cheri: Well I loved her description of being in this two hours of prayer and just, over and over again, “I need help. I need help.” You know? Those of us who are recovering perfectionists, we have hard enough times saying that to ourselves or to other people but I love that image and the fact that we can say that in prayer so I love that. How have I experienced the Holy Spirit as my helper? You know, when I’m in a new situation like if I’m traveling alone and everything is unfamiliar and confusing, I tend to fall into just this real conversational prayer. Sorry, page turn. Sorry Jen. I’ll just kind of talk through what’s making me anxious like talking through the decisions I need to make and I’ll even say things like, “Well okay, I need to get my rental car but I have no idea where it is so I guess that’s the next thing I’m gonna do is I’m gonna find my rental car” and you know, our listeners may think I am a complete nut job. I’m okay with that. The older I get, the higher the likelihood that is I’m gonna pull a muscle while I’m traveling and end up kind of hamstrung, which is not good if you’re gonna be a speaker. So for the past few years I’ve noticed that as I’ve gone by that Smart Cart, you know, stand where you can put your credit card in and, for at least some places, it’s $5 you can get a cart to put your luggage on. I have literally been having this impression, “Cheri, just get a smart cart” and part of me has always been like, “No, I can handle this myself” and it’s like, “Cheri, just get a smart cart” and so I have been doing that. I have been like, “Okay fine I’m just gonna go ahead and get a smart cart” and it’s not like the Holy Spirit shows up and actually manages my suitcases for me. It’s not like the Holy Spirit shows up and schlepps my suitcases for me but I feel like he does help me by steering me in the directions of options that I used to pride myself in not taking. How about you? Amy: Well I love that description. The Holy Spirit in your every day life. Alcoa Chambers talks about Holy Spirit as the helper and he says that it’s naturally unnatural, which I love that because I always thought it was like, some big thing and the story I’m about to tell is some big thing but it was some big thing, a big story, a big miracle and all that. Alcoa Chambers and what you just said is, “No, he’s just there naturally leading us through our every day life. If we’re wanting to tap into him and his guidance and traction.” That’s beautiful. Cheri: Okay so tell your big story. I think it’s both. It doesn’t have to be either or. It can be both. Amy: Yes, I agree. When I was in college, and I may have talked about this here, I was engaged to someone that I was madly in love with and that engagement was broken. I was heartbroken over it and one of the results of that was that I withdrew from God. I’ve been a Christian since I was 10, I’ve been passionately in love with Jesus since I was 16 but during that period of time, I didn’t know what to do with God. 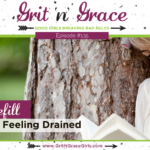 I felt like I had heard from him and the things that were happening didn’t line up with what I had heard. I was so crushingly disappointed and angry and grief stricken and I liked to bring cheerful to Jesus. I couldn’t do that and so I had just withdrawn from him completely. Amy: “This is what I’m thinking ’cause I haven’t been doing the things,” you know? “I haven’t been praying and having my quiet time and he knows that I’m really not happy with him but it’s okay ’cause I’m just gonna brace myself and take it.” This is seriously what I was thinking. Cheri: You felt like you were gonna be taken to the woodshed. Amy: I did. I did, I just knew I was. I was gonna get the big rebuke, you know? Suddenly, in that room and I’ve only experienced this twice in my whole life, was the most tangible presence of love. It was so overwhelming and it was the Holy Spirit helper who was coming to help me reconcile with my Father when I couldn’t do it on my own. Gracious, gosh, I’m old. That was a long time ago. Cheri: Oh, but it matters. Cheri: Aww, that’s beautiful, Amy. How many years ago was that? Amy: 21 years ago. No, 31 years ago. Oops. Cheri: That’s okay we’ll edit it ’cause I didn’t think the math added up quite right. Amy: I might be in denial. Anyway. 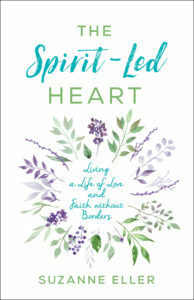 Cheri: “The Spirit Led Heart” what’s the big change, or what is a big change in your life because of the Holy Spirit helper or maybe what’s a role of the Holy Spirit that shows up in your life? Amy: Well, I did a study recently with one of my small groups about the roles of the Holy Spirit and he really is just so incredible and this is just a short list but like, teacher, helper, counselor, reminder, he says he’ll remind us of all the things that Jesus said. I wrote down, “Word giver,” because he said when they didn’t know what to say, he would come and speak through them. He told the Apostles that. He’s all these things, when I thought of all these roles, I thought the one that’s precious to me is that he is my teacher. One of my spiritual gifts is teaching but really, I can just, I have a limited ability to do that in my own power but having the Teacher, capital T, Holy Spirit Teacher pouring into me changes all of that. He empowers me in a way to teach that I could never accomplish on my own. One of the things, and Cheri, you know this ’cause we’ve been working on our book together but my process for writing or speaking is that I study the Bible first. Amy: It is the most miraculous thing to me that when I sit down with my Bible, something to write with, something to write on and I say, “Okay, Holy Spirit. Do your thing. Show me what this passage means” and I will get all these fresh insights and new facets and all this stuff that my brain just could never do on it’s own and the teacher comes in and does something in me so then I can share it with other people. Sometimes it’s from a stage and sometimes it’s on my blog but lots of times, it’s just with the person that I interact with that day and he teaches me and gives me something I can pass on to them. How ’bout you? How do you experience the Holy Spirit? So it’s like I go from ruminating Cheri to being action Amy because of the Holy Spirit, you know? In a good way, in a good way. Amy: That’s what I’m saying, are you sure that’s good? Cheri: Recently what happened is tomorrow night, actually, as of the day we’re recording this I’m gonna be giving a message for our senior class at the little Christian boarding school I teach and they invited me to speak for senior recognition. As a side note, abject terror has set in. It’s set in at 2:37am last night. I’m like, [00:10:30]. So I don’t know if I’m gonna sleep between now and then but it’s okay, God is good. And here’s the other thing, okay, I’m on a rabbit trail but let me throw this in. I mean, literally I laid awake panicking about all the things and yet because of my lifelong experience with the Holy Spirit helper I know that I’m gonna be okay. Even though I can’t quite get my hands to stop trembling, even though I can’t get my breathing quite the way I would like it to be and I did not go back to sleep, I still know it’s gonna be okay. I know the message that God has given is going to land in the hearts of the students and the parents who are there regardless of what happens with me. So actually, you know, I was invited to give a prayer request and I almost requested sleep but I’m like, “No, it’s actually kind of irrelevant whether I get sleep or not sleep because what God needs to have happen is gonna happen” and that kind of thinking is the Holy Spirit ’cause you know, Cheri Greggory’s brain does not think that way. Cheri Greggory’s brain is the panic producing brain. But then the Holy Spirit, I believe, orchestrated that moment when the student was able to say, “Ms. 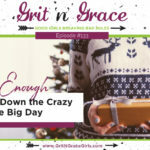 Greggory, do you have any hints?” And I was able to say, “No, I-” and the Holy Spirit reminded me, “Oh yes you do.” That, I don’t know, you know, there’s just nothing like that experience of knowing like, I didn’t force it, I didn’t make it happen. Clearly God is at work. It’s all good. Amy: Now I and all the listeners should sing the Hallelujah chorus because I’m just telling you there is no testimony, the awesome power of the Holy Spirit. Nothing more powerful than being able to reach into the hearts of very scary teenagers. that’s incredible. Amy: Well I think we all get that a group of seniors is probably the scariest audience possible, possible. Cheri: I like to say they keep me humble. Amy: Well I mean, you’ve given us a great example of this but okay, I’m gonna use the dreaded C-word now, Cheri. In what other areas of your life would you have to really give up control to see the Holy Spirit move? If I were to give up control, I would become unoffendable. I would be able to listen and have grace to the level of a hostage negotiator. That’s kind of like my new goal. How about you? Amy: Oh my goodness. Well I am reading a book of someone that we’re gonna be interviewing soon. Amy: I’m reading the book “One” by Deirdre Riggs. Oh my goodness, she has a chapter that just nailed me to the wall. We’ll save it for her upcoming interview, the majority of it, but basically the idea is that we have two seats to choose between. One is the judgment seat, one is the mercy seat. We cannot occupy both of them. God can occupy both but we cannot occupy both. The decision is which seat will I sit in? I tell you which seat I sat in most of my life. Cheri: The easy seat. The easy seat, right? Amy: It’s the judgment seat, yes. Yes, yes. But her point was is that when we move to the mercy seat we allow God to sit in the judgment seat and we allow God to do his full job and God to be God. Holy Camoli. I mean, this is messing with me. I mean, I have a situation in my life today that I had to decide yesterday, will I sit in the judgment seat and, oh, can I just tell you, I feel so right. I’m just telling you I felt so right. Or will I move over into the mercy seat, give up control and let the Holy Spirit helper do his work in this situation? I made a decision to move to the mercy seat. Now we’ll see how it all falls out, it might blow up, you know? I’m pretty sure if I’m not in the judgment seat that this might not work out. I’m just kidding. I’m kidding. Cheri: You’ve heard one of my favorite ouchie quotes. It’s from Pastor Clarence Shield in a book called “A Life to Die For” he says, “We do much, if not most of our sinning when we’re in the right.” Yeah, yeah. I just thought I’d share that with you today, Amy, ’cause you just look like you needed to hear that ’cause I really love to be the friend that brings comfort. Amy: Dead air. [crosstalk 00:18:42]. Cheri: Alright, well moving right along. Where have you landed that you never expected to land because of the Holy Spirit? Amy: Well and this is tied into the source of my angst today, which is very interesting. Women’s ministry, good googly moo, who wants to do women’s ministry? We’re such a freakin’ mess. Cheri: Amy, I wish you’d try to be a little more honest and like, get in touch with your feelings and tell us what you really think and feel. Amy: I can barely tolerate to be in the same room with myself. What possessed God to put me in rooms of women? No, I love you. All of you. Please stop. Cheri: I get it. I get it. We’re lovable, we’re so lovable but boy, when we’re a mess we are such a mess. It was so clear and like, a structure and everything. It was crazy and I was like, “Women’s ministry? Who would’ve thunk it?” Have you been taken some place unexpected? But I always have that collaborating. Like the Holy Spirit is my foundational collaboration that makes the other ones possible and healthy so yeah. I haven’t thought of that question at all so it was a great question to realize what I always wanted, I have. In a really much, much healthier way than I could have possibly done it on my own. Amy: Well and what occurs to me is that both of us expressed that the Holy Spirit has taken us to an unexpected place that brings us great joy. Amy: I can joke about women’s ministry but the truth is, you know me, Cheri. I’m a community girl and I love community and you just expressed the same thing. I think we’re so afraid of the Holy Spirit in some ways. We’re just sure he’s gonna make us move to Africa, you know? We’ve just expressed that wherever he takes us, it may be unexpected, but it will be more filled with joy than anything we could’ve dreamed up ourself. Cheri: So true. So true. Amy: So when we were talking to Susie, Cheri, you said that you can see the Holy Spirit is the cure for perfectionism. What did you mean by that? 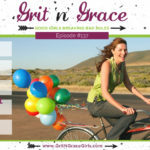 Susie chose to take the risks and so what I saw in all of this was that the Holy Spirit shifts our focus off our past failures and our current fears of failure and moves us to take action and to take risks ’cause when we’re taking action and taking risks, perfectionism doesn’t stand a chance. Amy: Appropriately so but for perfectionists we never believe that anyway, right? Cheri: Yep. Yep, yep, no. We never bought into it. Amy: So here we go. The Holy Spirit’s our solution because he flows in and fills the gap. Cheri: Absolutely. Well let’s end with something really encouraging and beautiful. How have you experienced the Holy Spirit as the comforter? Amy: This is very close and personal this week and it’s funny because I told one from a long time ago and so I was glad I had a story that just happened. We’ve had a really scary week this week. Amy: Berry started having, suddenly, I mean, one minute he’s fine and the next minute he’s not. Some very extreme symptoms and so, let me think about what I wanna say here. Amy: He started exhibiting some really extreme symptoms that pointed really strongly towards something that’s genetic and a health issue that’s genetic in his family so we went to a doctor appointment yesterday, as you know ’cause you were praying fervently. Amy: We really expected to walk out with a major diagnosis yesterday. The good news is, I’ll do the spoiler alert first is that that wasn’t what happened. It turned out to be something significantly more minor. However, the night before the doctors appointment was pretty intense. We had serious discussions about what life could look like if this diagnosis came to pass. But we got in bed that night and Berry has often done this for me when anxiety is plaguing me and he was the one who was the more anxious of the two. Amy: In this case. I just grabbed his hand and I was like, “Okay so let’s count our blessings” and we went back and forth and back and forth just naming the things that God has done. Remembering and that’s one of the things the Holy Spirit said he would do is that he would bring to remembrance the things that Jesus has said and done and Jesus is alive and active today so he has said and done things in our lives and we went back and forth and back and forth. The comfort that came from that was incredible. We were able to sleep most of the night. Amy: Did you want to tell your comforting thing? Cheri: No I did mine for perfectionism. You did that. It feels like a really natural lead in. Cheri: So what’s the scripture that you’ve paired with these episodes? Amy: Well it goes with my story but the advocate, the Holy Spirit whom the Father will send at my name will teach you all things and will remind you of everything I have said to you. John 14:26. Cheri: And what’s the bad rule for this episode? Amy: The Holy Spirit is too scary for me. Amy: That may sound crazy ’cause you know, a church girl would never say that out loud but come on, let’s get real. You know? The Holy Spirit, in main line denominational churches at least, is not spoken of, taught about, thought about very much. He is the neglected part of the trinity and so I think we have been kind of hands off and I just love that Susie has brought this into such a Biblical, beautiful space. Cheri: Absolutely. So what’s the fact to focus on instead? Amy: The Holy Spirit helper is a gift to me and you. He is. He comes and he fulfills all these amazing roles in our lives and makes the reality of God and his presence just tangible. Cheri: And then she also talked about that we might need to be liberated from our own expectations that have nothing to do with God’s plans. Expectations of others but also ourselves and so being hands off with the Holy Spirit and just being able to say, “Not my will but thine” and assuming that he’s gonna lead without giving me a blueprint or even a map. That’s hard for those of us who prefer a plan and something that resembles control. So that’s the gritty part. 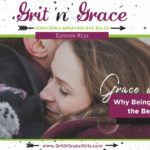 What’s the grace part for you? The Holy Spirit helper and comforter is a gift.